Later, reflecting already only on flies realistic and close to them, I specially caught a salmon, being guided in an estimation of efficiency of baits by frequency of accompanying grayling attacks. 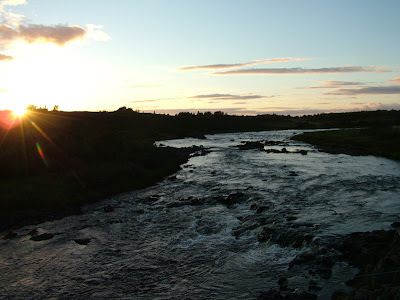 On records I have restored effectiveness of some of flies within a week of catching (09.2004) on Chavanga river.. Certainly, these figures do not allow to do any thorough conclusions. But for me the fact of documenting of interest resident and a silver salmon to imitations of insects and influence of conducting on frequency of attacks was important. I alternated a method of "a wet fly" with "aggressive wet" and catching on the nymph downstream. On reaches, rifts and other places I tested serially 2 or 3 flies, replacing successful and trying the new. 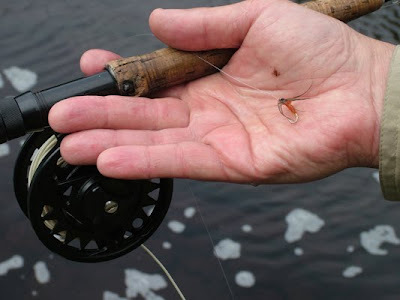 Can seem that I exaggerate in attempt to draw attention to rather productive, in my opinion, to a way of catching of a salmon on usual imitations of sedges, stoneflies and on weight of similar realistic and fantasy flies. 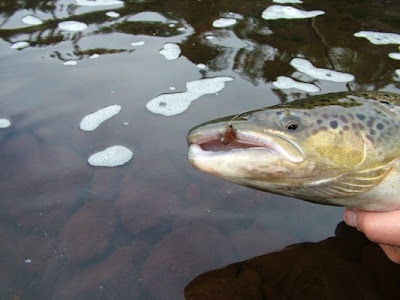 I have no anything against traditions, against beauty of salmon flies and their efficiency in skilful hands. But it seams to me that nonconventional catching does not demand not only special flies, but also tackles of a "salmon" class seems important. After all for presentation of flies of 10-14 sizes are not necessary two-manual fishing-rods and other. It simply other world of enough delicate catching of large fish and special emotional aura which has the admirers.